On one of our last days in Japan we stopped at Toukyo Gallery, a famous gallery in Tokyo specifically for exhibiting Japanese handcrafts. 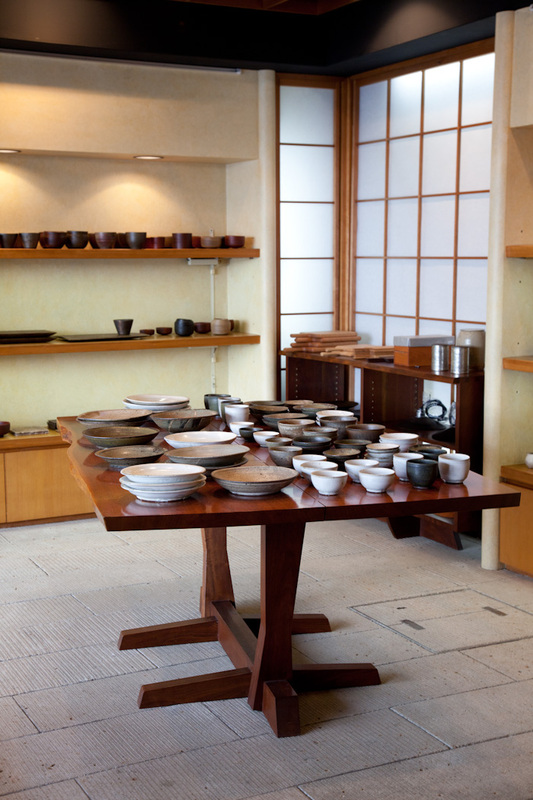 The gallery is filled with original George Nakashima furniture, which was purchased by the owner of the gallery at a Nakashima exhibition in the 1980s. His collection is now priceless. 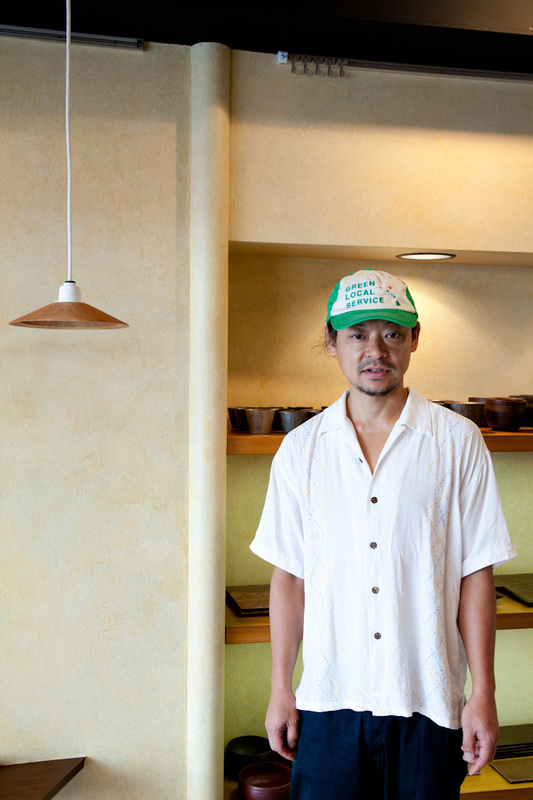 Here at the gallery we got to meet Tomiyama Koichi in person, an artist that we have been working closely with to bring his works to our store. 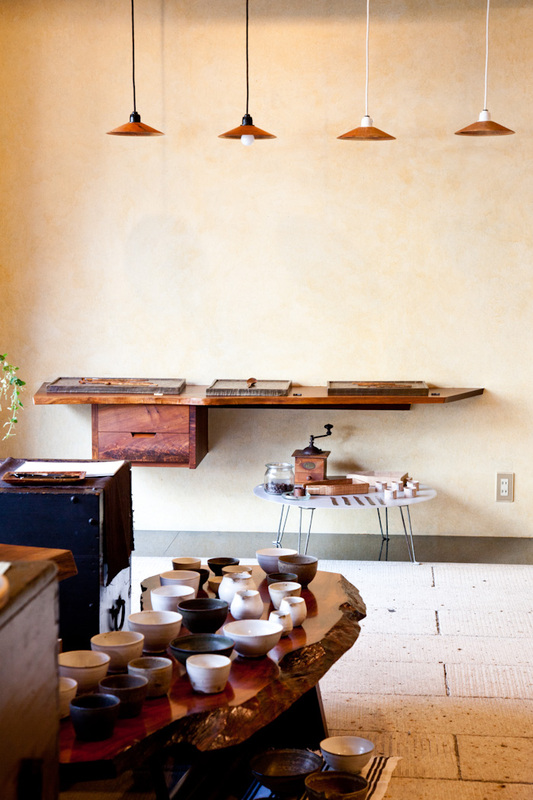 Koichi san has a wonderful collection of studio work which consist of beautiful handmade cutting boards, trays, spoons, and pendant lights. But he also spends a lot of time experimenting with different materials and lacquer finishes and continues to show one of a kind art pieces at galleries all over Japan. 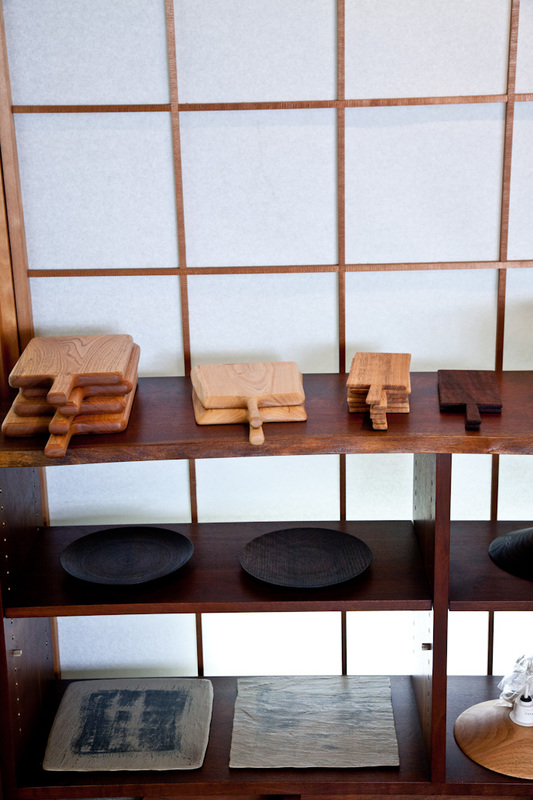 In this photo you can see the studio cutting boards on the top shelf, and then black lacquer dishes, and at the very bottom a completely unique idea. finishing slabs of slate with traditional white lacquer-ware, Koichi-san mentions he doesn’t think this has been experimented with before. 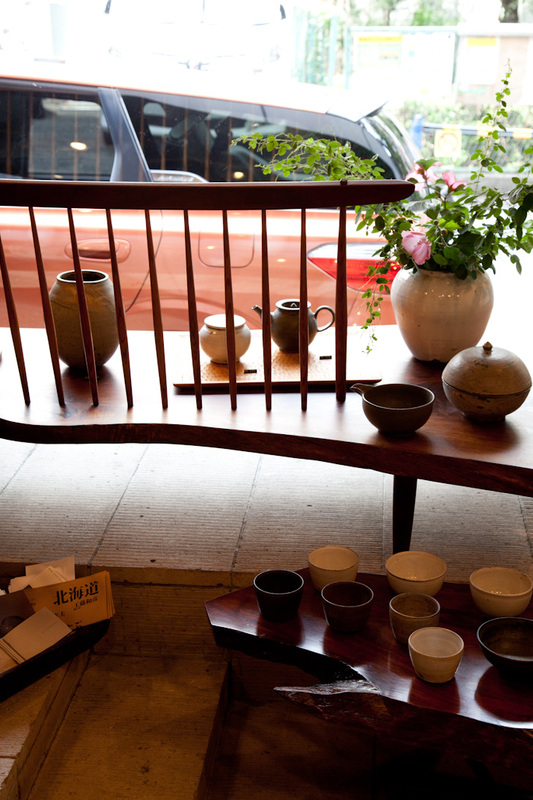 The front of the store has a beautiful long George Nakashima bench, with a collection of ceramics. A set of wood nesting bowls in different lacquerware finishes: black, white, and red. 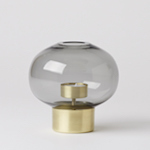 Each colour is made from a tree sap mixed with a different powder metal. 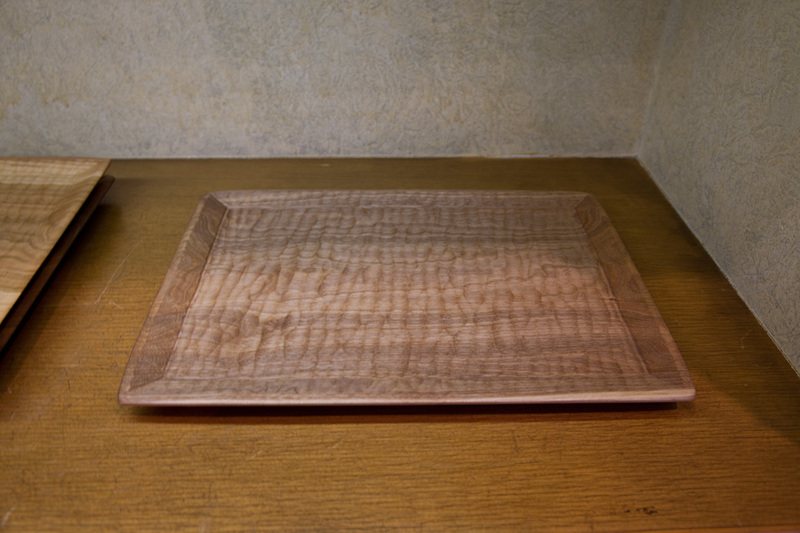 A hand tooled tray we’re looking at stocking in the store very soon. 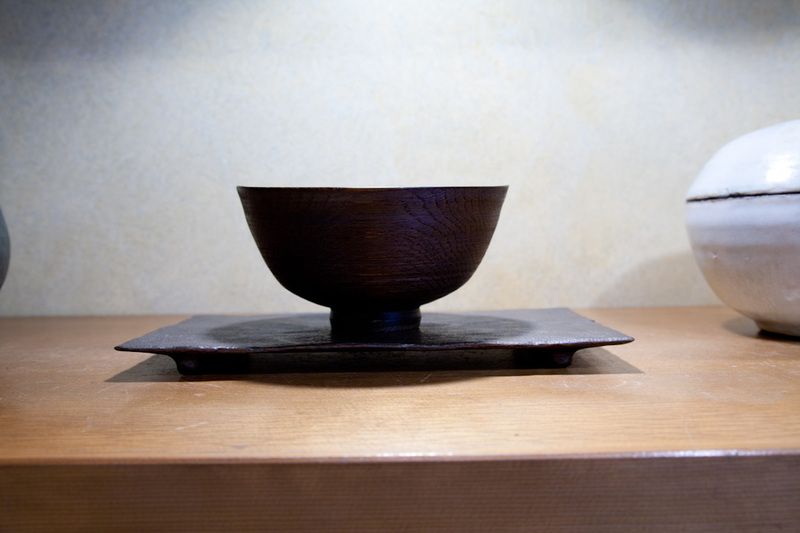 One of the few hand turned bowls in the exhibition. 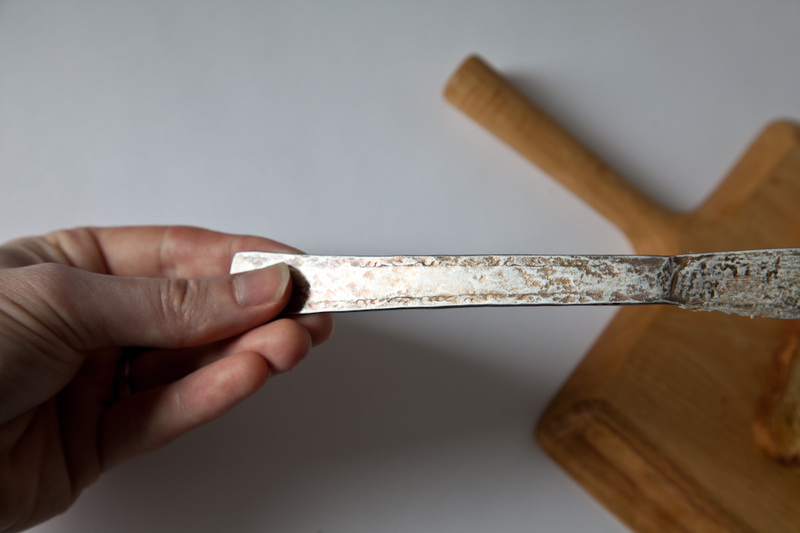 A new material Tomiyama Koichi has been exploring is hammered steel. He made this small metal table for the exhibiton, and on top is his collection of new coffee scoops (which are now on our online store). 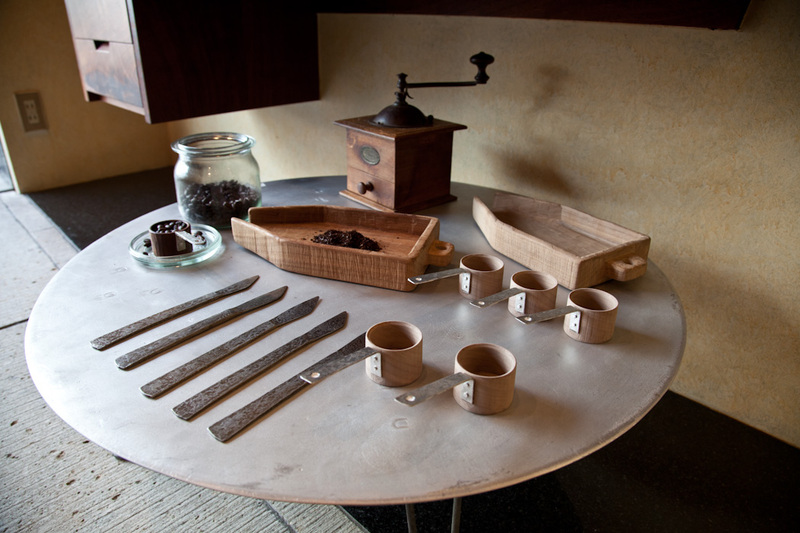 The wooden trays are used to bring grounded coffee to the filter for easy pouring. Of course while we were at the exhibition a couple pieces caught our eye, and we couldn’t help picking them up. 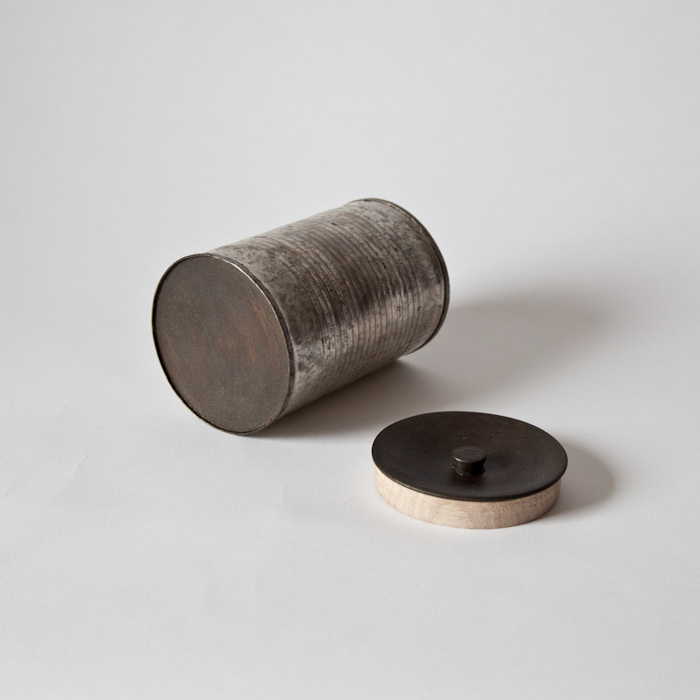 One of our favorite ideas was this tomato tin, it was re-purposed to be used as a storage container. 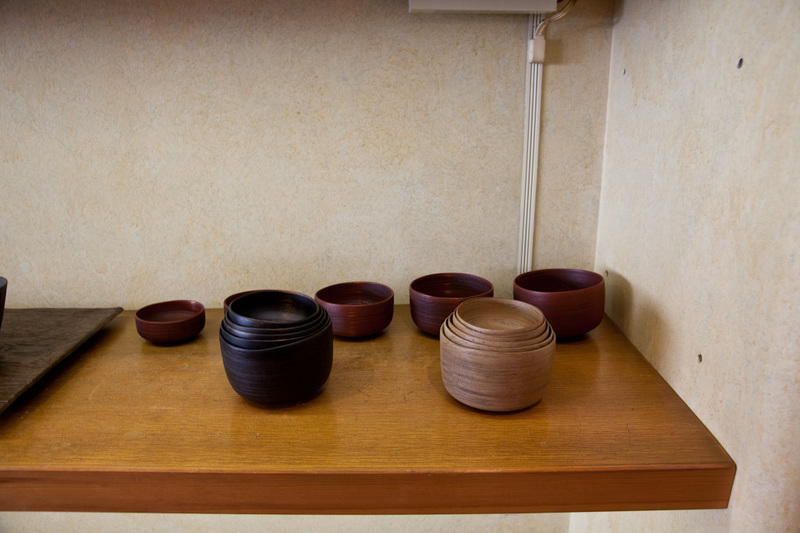 The bottom and top were replaced with wood and finished with Japanese urishi. The fit is perfect, and it will look beautiful in our kitchen. A set of some of our collection so far. 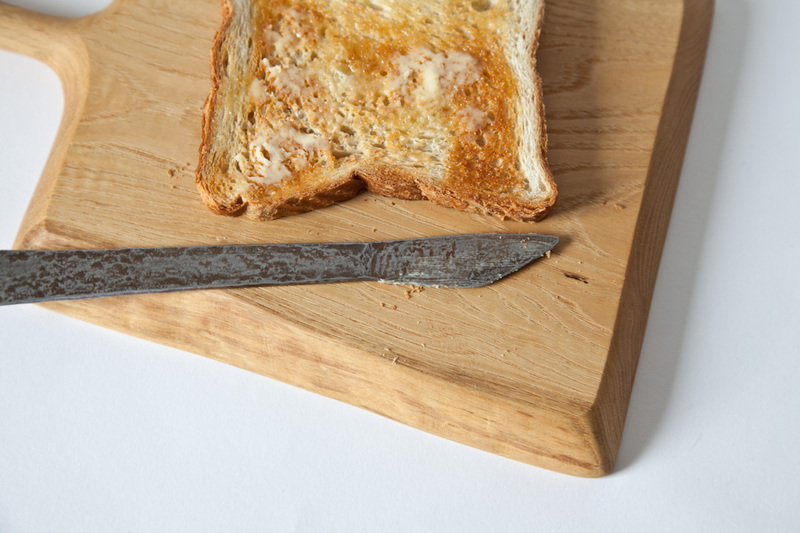 The other piece we got was this butter knife. 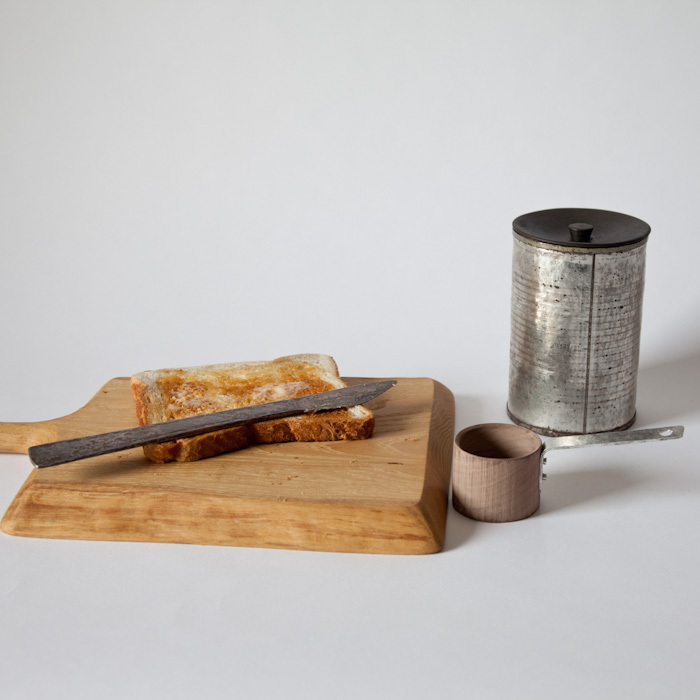 It is actually made from old discarded stainless steel butter knifes. The original long blade is cut down and made more functional, the original handle is hammered down and finished with Japanese urushi. You can see a little bit of the old flower pattern in the handle. 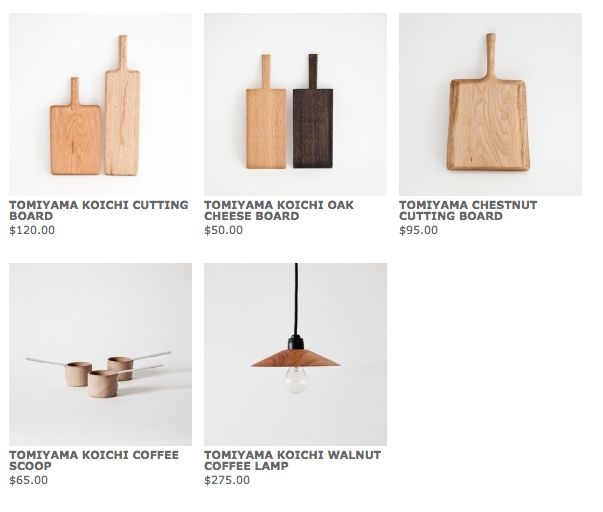 Please visit our online store, or the physical store to see our collection of Tomiyama Koichi!